As I've mentioned before, I am what is known in airline parlance as a commuter. This doesn't mean that I drive to work, it means that I live in a different city than where I work. It also means that getting to and from work involves a plane ride. I guess it's a little like having to take public transportation because that's actually what it is. It's the waiting at a bus stop for a bus that doesn't come that can be a drag. Being a commuter and subjecting yourself to the vicissitudes of commercial aviation on a weekly basis necessitates that a certain zen-like attitude be maintained. Any business person who travels on a frequent basis knows exactly what I mean. From parking at the airport to the TSA and surly gate agents who seem to relish keeping you off the plane, it's a miracle that anyone flies at all. God bless those that do, though, because they're the source of my livelihood. And I've probably got it a little easier in some respects than the paying customer even if I'm not assured a seat at all. Nearly a decade after 9/11, the TSA finally recognized that crew members aren't really the enemy and have instituted a trusted traveller program for airline crews. This makes security screening a little easier to take. And in some cases I get to pre board the aircraft if I will be riding in the cockpit. Otherwise I have to board at the end of the line. Even then, knowing that most passengers always head to the back to find the by now non-existent aisle seat, I take the first middle seat I can find which is usually near the front. But overall, the entire process is somewhat dehumanizing and tedious. The term "thousand yard stare", used by shell shocked soldiers applies when commuting. It's a defense mechanism used to shield your psyche from the inevitable realization that while you got off of work at 3pm, you may not get home until 9pm or perhaps not at all. This was my experience last week. Finishing a three day trip with a scheduled arrival at my domicile of 1610, I knew making my commute flight home which was scheduled for 1600 was a long shot, but Chicago almost always comes through for me in delaying flights so I thought I had a fighting chance. We were coming in from the west with a significant tail wind and I wasn't being stingy with the throttles either hoping to arrive ahead of schedule to increase my odds. My F/O was taking a later flight home and agreed to babysit the jet so I could punch out and run for my flight. Even air traffic control seemed to be on board asking us to "maintain maximum forward" for traffic. Gladly, we said. Then the plan changed. We were told to slow to 250 and to turn 20 degrees to the right. This is the equivalent of slowing to 55 and then to get off the freeway onto a surface street. Not helping. And this was done several hundred miles out. Apparently we were to be sequenced behind a Citation. The Cessna Citation, affectionately known as the "Slow-tation" is the slowest business jet in the air. The joke goes that it has bird protection screens installed...on the exhaust to keep birds from flying into the back of the engine. The new Citations are much faster but too many of the old ones still clog up the skies. Eventually arriving, I noticed several jets waiting for takeoff and correctly guessed that one of them was the one I was trying to catch. Oh well. I'll just hang out in the pilot lounge, maybe do some online training and get some dinner before catching the next one at 1850. As I listed for the flight, the computer screen said the flight was unavailable. It had been cancelled. OK, I guess I'll get the rest of my training done, get some dinner and catch the 2000 jet to be home by perhaps 2200. Getting home at 10pm after a 4am wakeup is not ideal, but at least I'll be home. No such luck. As I was clicking through the online training screens on the lounge computer, my phone beeped again. A text message from the airline mentioned a cancelled flight. 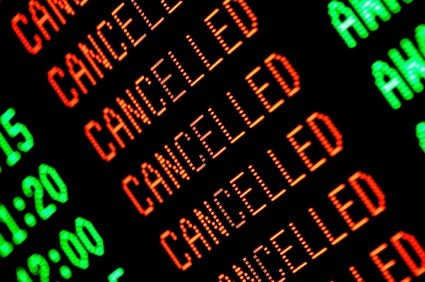 I thought it must be a repeat message but no, the last flight home was cancelled. Great. Another night in the crashpad. Well, I was thinking that if I have to do the time, I might as well do the crime and go fly. And sure enough, due to all the cancellations there was some open flying for the next morning. One trip in particular had a late morning show and flew one leg to San Antonio and then deadheaded home. I'd fly that leg, get released from the deadhead and be on a plane home in a few hours after that. I'd get home only a few hours later the next day with a decent paycheck to show for the effort. Seniority has its privileges and I got the assignment. The temperature dipped that night to negative five degrees which probably had something to do with all the cancellations but it made for a chilly hike to the crash pad. On the bright side, when the weather is really awful, I don't worry so much about meeting one of the more vibrant denizens of South Chicago looking for forced charity, so there's that. The flight to Texas was uneventful and I was released from having to deadhead back to Chicago, which by then was in a snowstorm, so all was looking good. Then an announcement was made that the flight attendants working the flight were delayed a half hour. No prob. Time for a salad. We boarded, taxied, and then sat. The anti-skid braking system had a problem which meant a gate return. It also meant that that airplane wouldn't be flying anytime soon. That system almost never breaks but when it does, it isn't a quick fix. My concern now was whether this flight would be cancelled. Luckily it wasn't cancelled but we did have to wait two more hours for another flight to arrive from Phoenix. Only then would I be allowed to go home. Finally airborne, I arrived home at about 10pm, a day after getting off work. While I don't necessarily believe in karma, considering that the day before Christmas eve I made my commute flight after an international arrival with 15 minutes on the ground I figured that I was due for a little trouble getting home. The universe is in balance once again.